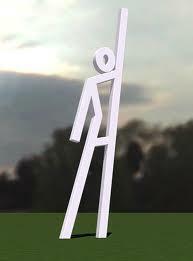 Evacuation locations will be marked by 14-foot-tall sculptures. 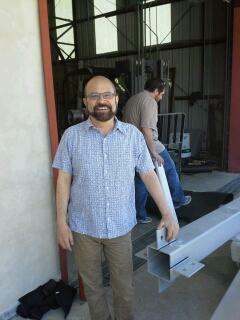 Artist Douglas Kornfeld of Cambridge, Mass., checked the sculptures as they arrive at a New Orleans warehouse. Fifteen stainless-steel sculptures have just arrived and will soon be appearing throughout New Orleans. The unique public art project is designed to help save lives. Imagine those stick figures commonly seen on men’s and women’s restrooms. Now imagine a stick man is hailing a cab. And he’s 14 feet tall. That’s the concept behind the sculptures that will mark evacuation spots throughout the city. David Morris of volunteer coordinators evacuteer.org says it enhances the evacuation system triggered in 2008 for Hurricane Gustav. The sculptures will clearly mark where people can wait for a bus. “People who don’t have access to reliable transportation — and there are an estimated 30,000 people like that in the city of New Orleans — can now have a public option for a ride out of harm’s way when the mayor calls for a mandatory evacuation,” Morris says. Buses will take people to the Union Passenger Terminal. They’re then taken to official shelters in the region, and given transport back home when the storm is over. Douglas Kornfeld is an artist from Cambridge, Massachusetts, who won the commission from the Arts Council of New Orleans for the $200,000 project. Stainless-steel sculptures will mark spots where residents wait for evacuation buses. Information will also be on the sculpture itself. He says he watched with millions of others in 2005 what people endured after being stuck in New Orleans after Hurricane Katrina. “Biblical disasters just, they seem like, 'Oh. They don’t happen in America,'" Kornfeld said. The city and transportation officials detailed where the sculptures will be. Morris says all 15 sculptures and two large signs should be in place when hurricane season starts June 1. David Morris of evacuteer.org and artist Douglas Kornfeld discuss the public safety aspect of the project.